Preparing for your wedding? Excellent! Every future bride wants to look gorgeous at her own wedding. If you wanna be the one at the wedding ceremony and emphasize your uniqueness you have to wear the right wedding dress, which, to me, is the key of success. 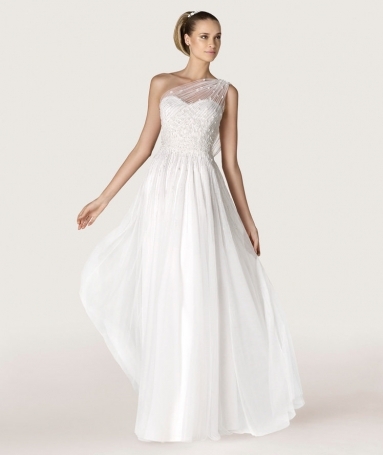 I'm quite sure that choosing a wedding dress is the most exciting moment of women' life. Luckily, there is a large assortment of wedding dresses nowadays. Pronovias Spanish Fashion company, specialized in wedding dresses and accessories, offers a big collection for future brides. This company, founded by Alberto Palatchi Bienveniste, presented its first collection of bridal gowns in 1964. It launched its first fashion show in 1968 in Barcelona and went international in 1980. Today this company has shops in over 60 countries worldwide and it continues expanding every year. Here are some of the wedding dresses from Pronovias 2015 Pre-Collection. The full collection is available through this link.